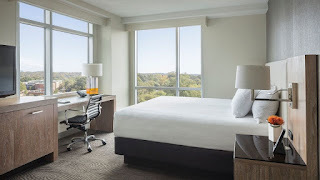 Hyatt Hotels announced recently strong US growth for portfolio, including development plans to build Hyatt Centric hotels in downtown Memphis, Tennessee, downtown Nashville, Tennessee, and downtown Austin, Texas. Designed for a growing segment of savvy explorers seeking shareable moments to inspire others, the Hyatt Centric brand currently has 26 properties across 11 countries, including Chile, France, India, Japan, Spain and more. The 227-room Hyatt Centric Beale Street will be developed through a joint venture between affiliates of Hyatt and Carlisle Hotels, Inc. The hotel will be developed within Carlisle’s One Beale Street mixed-use project, to be located at the intersection of Beale Street and Front Street, just one block east of the Mississippi River and Riverside Drive. In addition to 227 guestrooms, Hyatt Centric Beale Street Memphis will feature a rooftop lounge, offering breathtaking views of the city’s skyline and Mississippi River, as well as a ground floor lobby containing the hotel restaurant, bar and fitness centre. Just off the lobby, guests will also enjoy an open-air courtyard with an outdoor swimming pool and fire pit, plus more than 14,000 square feet of meeting and event space located on the other side of the courtyard within the historic Wm. C. Ellis & Sons Ironworks and Machine Shop. Hotel construction is slated to begin in the second quarter of 2019, with an anticipated opening date by the end of 2020. Local Memphis design house, HBG Design, has been engaged for the hotel project. These developments are in addition to recently announced Hyatt Centric hotels in Los Angeles’ Koreatown neighbourhood, near Rittenhouse Square in Philadelphia and near downtown Portland, Ore. Further expanding the Hyatt Centric brand’s global footprint, these developments will join newly open hotels in Midtown Atlanta; Bangalore, India; Goa, India; Lima, Peru; Brickell, Miami; and Santiago, Chile.